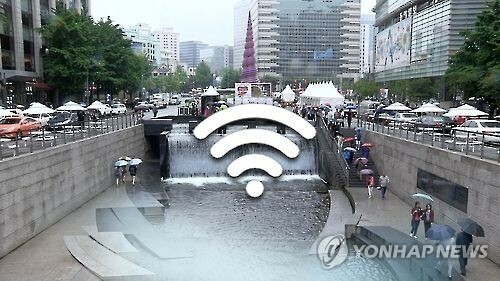 The speed of WiFi-connected Internet services have become faster this year thanks to improved equipment, especially in subway stations, government data showed Wednesday. The average downloading speed using WiFi networks across the nation stands at 144.73 megabits per second this year, up 57.5 percent from 91.87 Mbps in 2015, according to the Ministry of Science, ICT and Future Planning, and the National Information Society Agency. The pace of uploading data has increased 65.9 percent to 141.47 Mbps. It is mainly due to the replacement of related devices at subway stations with upgraded ones. In fact, the speed inside the facilities has quadrupled to 270.4 Mbps on average. By service provider, downloading with KT Corp.'s networks is the fastest with 162.4 Mbps, followed by SK Telecom Co. with 150.77 Mbps and LG Uplus Inc. with 121.15 Mbps. SK leads in the successful connection rate with 97.03 percent, while those of LG and KT are 91.67 percent and 87.61 percent, respectively. In case of fourth-generation LTE, common for smartphones, the average speed climbed slightly to 120.09 Mbps from 117.51 Mbps recorded last year.